A nice tune from Sarah. Her vocals are really strong, and she delivers well. Not that good at all, pretty ordinary. She oversings it a fair bit, but it's decent. She does oversing a little, but of the final 4's originals, this is definitely the best. Gutes Popstück von Sarah de Bono. 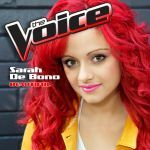 An outstanding song from 'The Voice' but just above average when compared to everything. Good. One of her best.